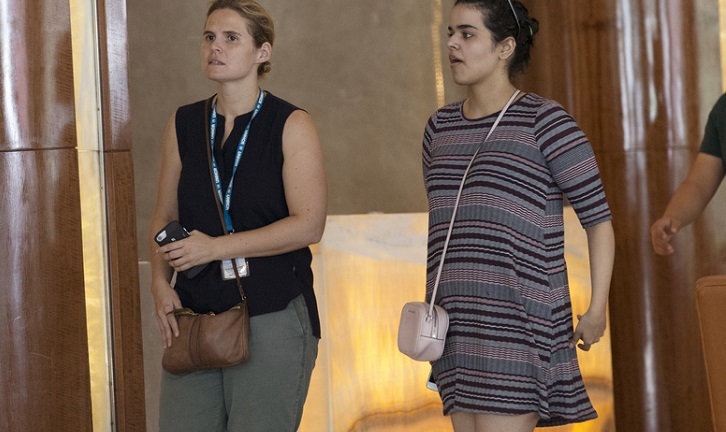 An 18-year-old Saudi runaway who said she was abused and feared death if deported back home arrived in Canada Saturday arm-in-arm with the country's foreign minister. Rahaf Mohammed Alqunun smiled broadly as she exited an arrival door at Toronto's airport sporting a Canada zipper hoodie, capping a dramatic week that saw her flee her family while visiting Kuwait and before flying to Bangkok, where she barricaded herself in an airport hotel to avoid deportation. The case grabbed global attention after she mounted a social media campaign for asylum. "This a very brave new Canadian," said Foreign Minister Chrystia Freeland. Prime Minister Justin Trudeau announced Friday that Canada would accept Alqunun as a refugee in a case that has highlighted the cause of women's rights in Saudi Arabia, where several women fleeing abuse by their families have been caught trying to seek asylum abroad in recent years and returned home. Human rights activists say many similar cases go unreported. "She had a very long and tiring journey so she would prefer not to take questions today," said Freeland, adding that she would take questions later. Alqunun earlier tweeted two pictures from her plane seat - one with what appears to be a glass of wine and her passport and another holding her passport while on the plane with the hashtag "I did it" and the emojis showing plane, hearts and wine glass. On Friday, Trudeau avoided answering a question about what the case would mean for relations with the kingdom, but he said Canada is pleased to give her asylum because Canada is a country that understands how important it is to stand up for human rights and to stand up for woman's rights around. Canadian officials were reluctant to comment further until she landed safely. It wasn't immediately clear what prompted Alqunun to choose Canada over Australia. Australian media reported that UNHCR had withdrawn its referral for Alqunon to be resettled in Australia because Canberra was taking too long to decide on her asylum. Alqunun's father arrived in Bangkok on Tuesday, but his daughter refused to meet with him. Surachate said the father - whose name has not been released - denied physically abusing Alqunun or trying to force her into an arranged marriage, which were among the reasons she gave for her flight. He said Alqunun's father wanted his daughter back but respected her decision.